This is Buddy and Duchess. Buddy was 12 and Duchess was 6 in the photo. 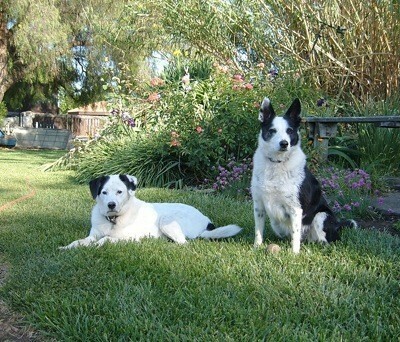 Buddy was a Queensland Heeler mix and Duchess is a Border Collie. Buddy was given to us in 1996 right after we bought our home by a local farmer who thought we needed a dog. Duchess came to us via a cowboy friend who used dogs to herd cattle; this was in 2001. Buddy has passed away but he loved to do any type of "job". He was a great chicken herder and gopher hunter! He also loved to snuggle and would sleep with any company who spent the night. That way he could keep an eye on them. Duchy loves to swim and will swim in the pool 4 or 5 times a day in the summer. She likes going on walks and helping in the garden as well as chasing dragonflies! Buddy was the best boy ever! He was loyal, protective, handsome and brave. We miss him every day. Duchy is so funny. She loves all her toys and enjoys hanging out with her Dad. She likes t share kisses but only when she is in the mood!